Who were these readers? Not, mostly, pupils at schools like Greyfriars. 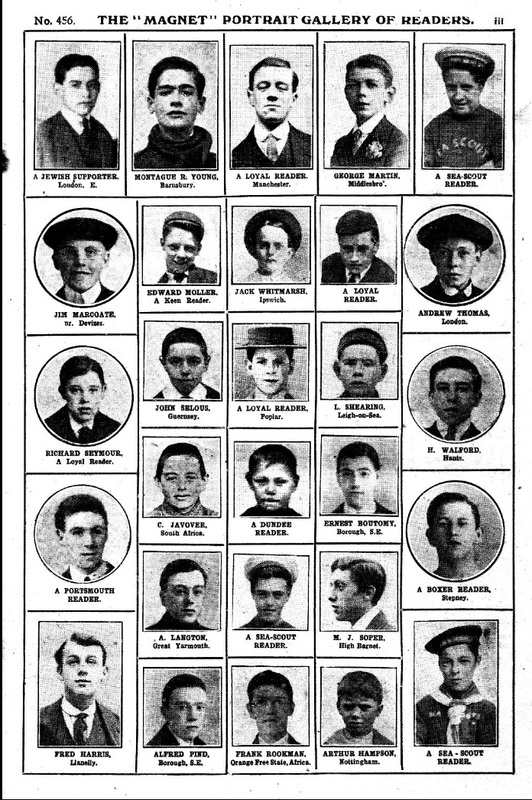 Many of them were students at much less distinguished schools, or boys who had left school at twelve to become office boys or apprentices. No girls are included among these pictures, though there definitely were girl readers, and several of the readers’ messages that appeared from time to time are from girls. Mary Cadogan once claimed that there were as many girl readers as boys, but that seems an overestimate to me. 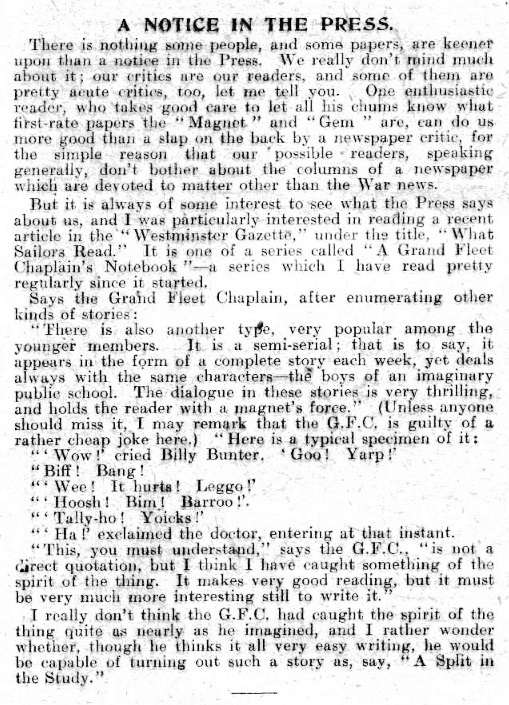 There were enough, though, for Hamilton and his Amalgamated Press editors to see the potential of a new magazine featuring Billy Bunter’s sister, Bessie. 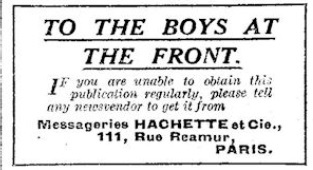 There are also often messages from soldier readers asking for pen-pals, or for copies of the magazine. One issue contains the addresses of readers who are prisoners-of-war in Germany, and asks readers to send them back numbers of their favourite magazines, the Gem and Magnet. There are also sometimes messages from parents, asking for any information concerning the whereabouts of a soldier who is missing. The Magnet and Gem also had readers in prep schools, young boys who would soon themselves be going to a public school. From his autobiography we know that Evelyn Waugh greatly enjoyed the magazines at this time (his enjoyment enhanced by official disapproval). There might be a Ph. D. in tracing the influence of Greyfriars on Waugh’s comic vision. 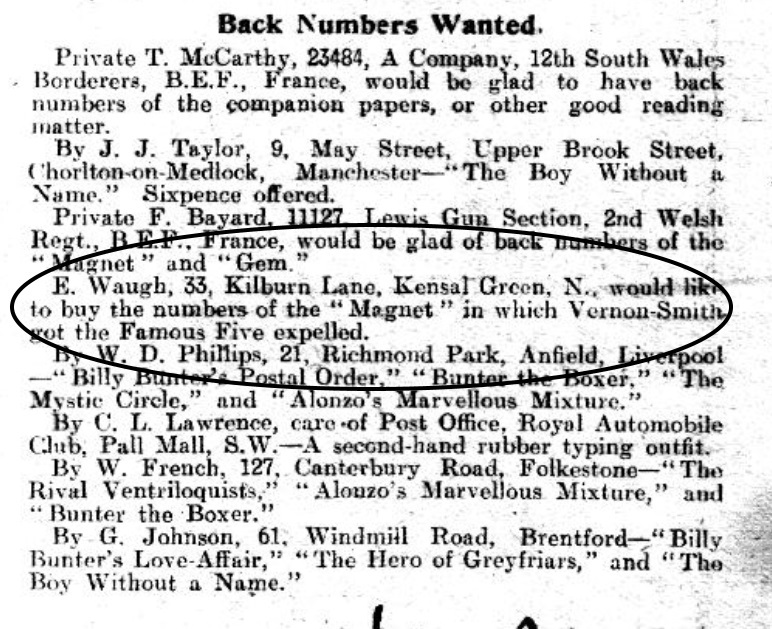 So I can’t help but wonder whether the E.Waugh in this 1916 list of back-number requests might not be the future novelist. He’d have been about thirteen at the time. The young Waugh lived in North London, but not at this address, so far as I know. But maybe he wouldn’t want unrespectable reading material delivered to his home… I’ll try to do a little detective work on the address. This entry was written by George Simmers and posted on October 17, 2015 at 4:01 pm and filed under Magazines, popular culture, publishing with tags Evelyn Waugh, Gem, Magnet, soldiers' reading, Westminster gazette. Bookmark the permalink. Follow any comments here with the RSS feed for this post. Post a comment or leave a trackback: Trackback URL.